With the cool temperatures and fall weather of late November approaching, it is time to switch gears from the early season hunts and start to chase the rutting hard-horn bucks of the West. 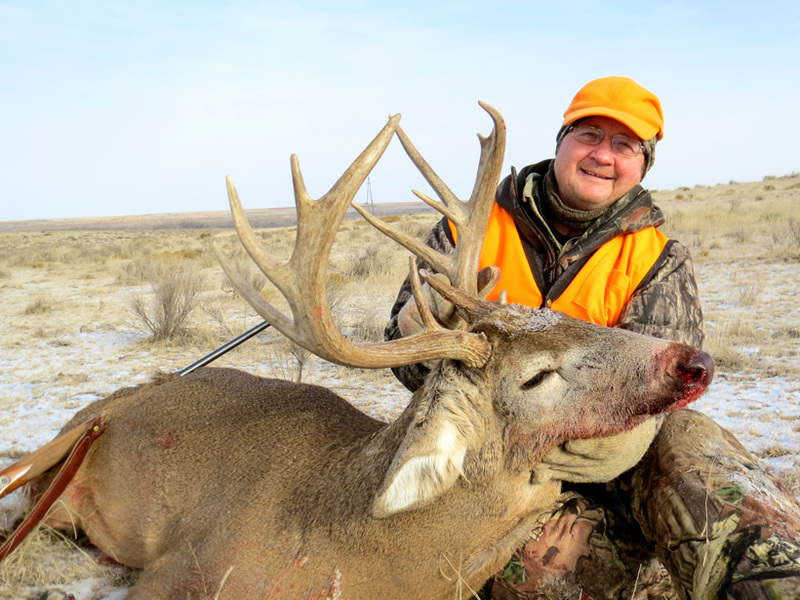 Hunting seasons for Western whitetails are extremely liberal, with season dates ranging from September through January. 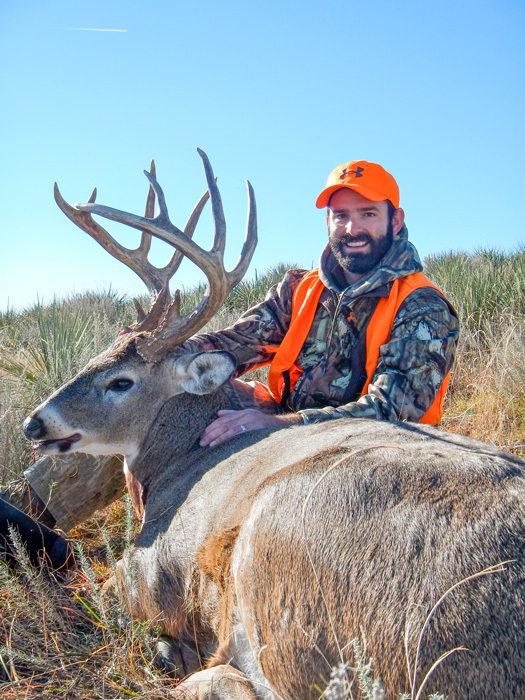 With the wide variety of Western whitetail options available, understanding the various phases of whitetail behavior is critical. Recovering a whitetail buck taken in late November. Across the range of the Western whitetail, September is a month of relative calm. Bucks typically remain in their summer range as summer food sources dictate deer distributions. Agricultural crops such as alfalfa, milo (grain sorghum) and sunflowers all play major roles in deer distributions. Bucks are typically found in their summer bachelor groups and remain on their summer feeding patterns until the end of the month. Mature buck movement during September can be extremely slow. Focus your hunting efforts on locating mature buck bedding areas. Once these areas are located, it is possible to catch a buck slipping into or out of his bedding cover in the twilight hours of the day. Early season whitetail. This buck was highly visible during late September. Early season scouting resulted in mid October success (harvest photo below). Fall weather takes full effect during the month of October. Cooler temperatures and shorter days bring the pre-rut to full swing. Bucks typically abandon their summer bachelor groups during this period as they shift from their summer feeding areas to their rutting grounds. This shift can range from less than mile to over 10 miles, depending on the deer. Deer movement during this period is generally highly weather dependent. Early cold fronts can make for whitetail hunting magic during the month of October. Pre-rut activity will ramp up as the weather cools. Rubbing and scraping activity will become very evident toward the end of October. October can be a frustrating month to chase whitetails if the weather is warm. In most areas, the key to success is locating whitetail food sources. 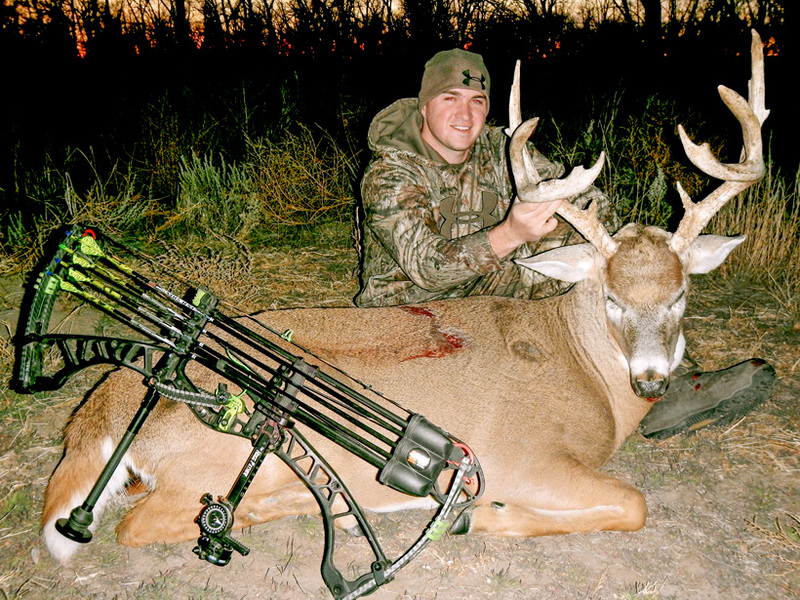 Most states have bow seasons during October. Consider using tree stands and ground blinds to harvest bucks as they move to and from their food sources. 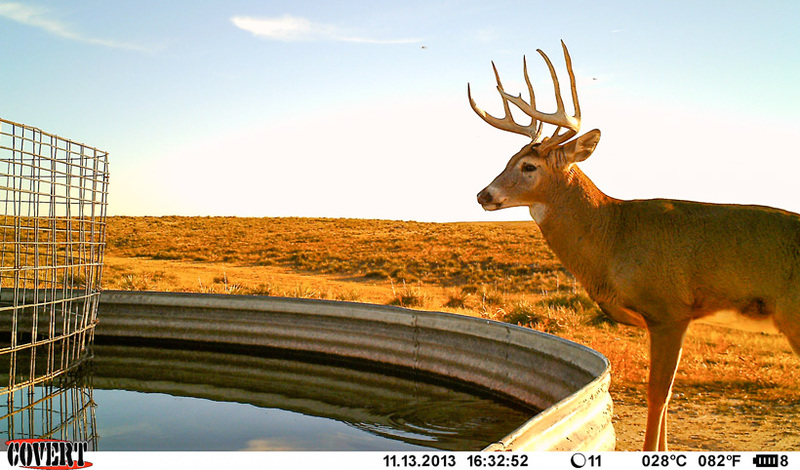 October success: This buck was highly visible early in the year. As rutting activity started in earnest, we were able to harvest him less than two miles from where he summered. November is the month of the whitetail. In most of the whitetails’ Western range, peak-rutting activity will occur between November 8 and November 15. 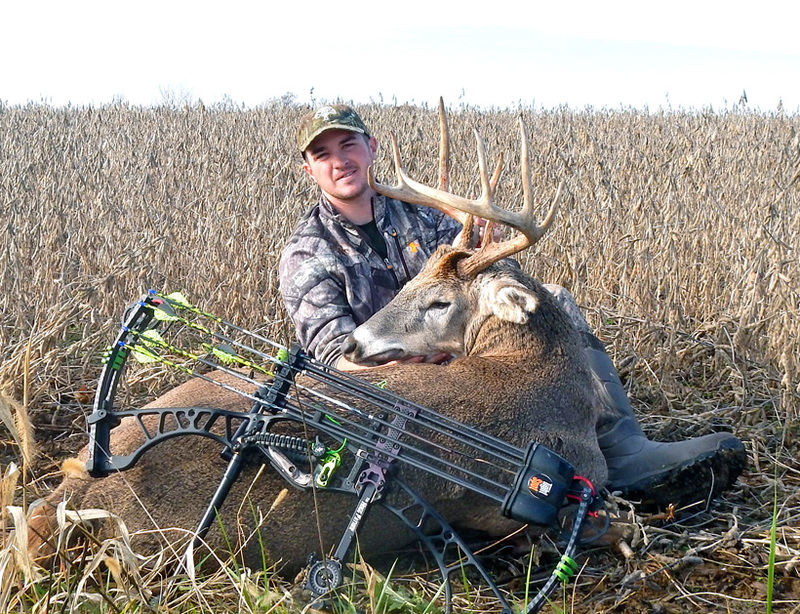 With rutting activity at a peak, November can be a great month to pursue whitetails with either a bow or a gun. Just like early season hunting strategies, locating food sources and travel corridors is the key to success during this period, too. Bucks will cover large areas in search of does. Midday movement is not uncommon during this period, especially if cold November weather moves in. The rut does create some issues for hunters. Locating, patterning and harvesting individual bucks can be extremely difficult during this period. Buck movements can be characterized as “sporadic” during the peak of the rut. If you encounter a large rutting whitetail this fall, persistence is the key. There may appear to be no rhyme or reason to his movements; sometimes the only way to pursue him is through consistently placing yourself in areas with high amounts of doe traffic. Early November success: I was fortunate to have this buck come through a pinch point in early November in search of does. I had not seen this buck before and hunted an area with a high concentration of does. Toward the end of November, rutting activity will slow as bucks return to more of a feeding/bed pattern. 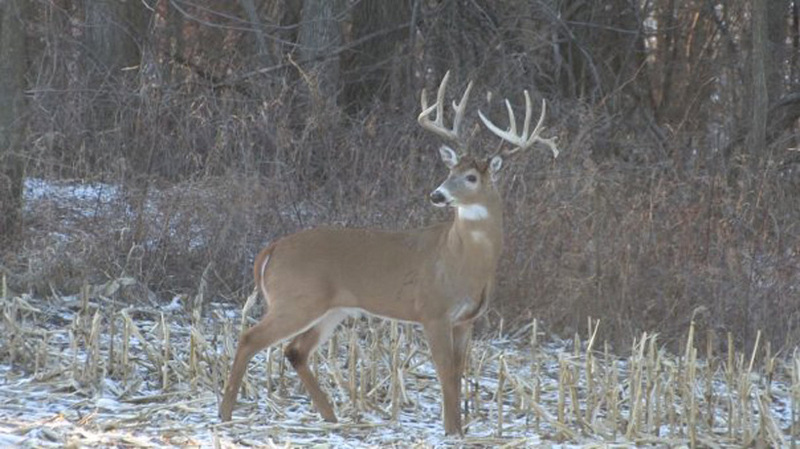 This can be a great time to pattern and harvest mature bucks. Once again, locating food sources is the key to success. Key late season food sources are typically cut corn in agricultural areas. In areas lacking agriculture, do not overlook areas that have been recently logged. In these areas, natural forage becomes more concentrated as sunlight hits the forest floor, resulting in a number of desirable late season food species. Once a good food source is located, diligently manage your hunting pressure and watch for late November cold fronts that will bolster deer movement. Late November success. 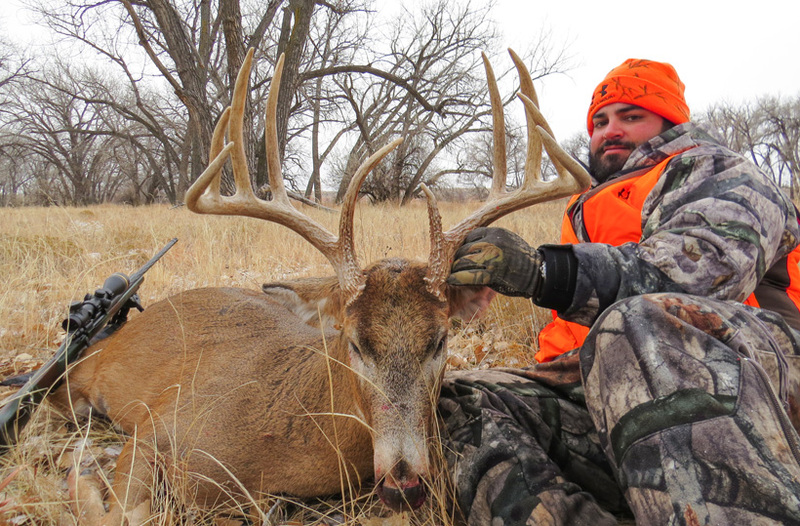 This Kansas buck was the result of many hours of scouting. After locating him using a remote wheat field, I was able to hone in on his bedding area. With a little luck, and a lot of persistence, late November can produce some great bucks! Most of the giant whitetails taken each year are taken sometime in the month of November. This is due to a variety of factors, including that most states have archery season dates that encompass the peak of the rut and that mature bucks tend to be highly nocturnal outside of the rut. December is a month of cold weather and wind across most of the Western whitetail range. 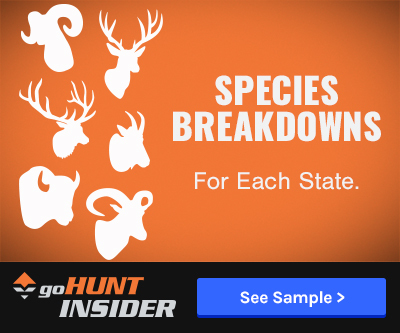 Many states have gun seasons during the beginning of December that can make for some excellent hunting even though the rut is typically over by this time of year. Occasionally, you will find mature bucks chasing does during this period as some does that may not have bred during the first cycle in November will come back into estrous. While relatively common, rutting behavior is not something you should count on during a December hunt. Cold weather and post-rut conditions make December a prime month to pattern bucks moving to and from major food sources. Bucks are typically extremely worn down from the rigors of the rut and prone to make mistakes as cold weather plays havoc on their already depleted fat reserves. Readily available food sources that provide high amounts of fat and carbohydrates will hold most of the deer in a given area during this period. Hunt strategies during this season should all center around late-season food sources. Once a good food source is located, diligently manage hunting pressure to ensure that bucks continue to use the food source in daylight hours. At this point in the year bucks have been hunted for several months. Deer sensitivity to hunting pressure is at an all-time high during this season. Make sure that you watch the wind and wait for the right conditions. December success. My dad and I were lucky enough to locate this buck using a cut cornfield one cold December afternoon. The next morning we located ourselves between his food source and his bedding area. The rest is history. The early season can be a difficult time to harvest mature bucks. I define early season as any period in which mature bucks are still in their summer patterns or the beginning of the pre-rut. 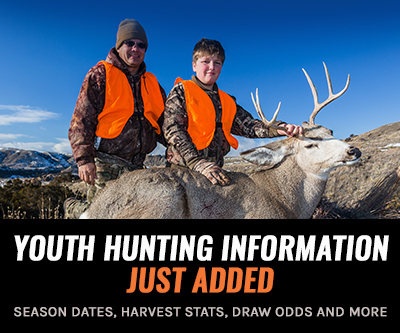 These hunts range in dates from early September to mid-October. For these hunts, I want my scouting-to-hunting time to be at least a 3:1 ratio (three days of scouting for each anticipated hunting day). Why the large number of scouting days? In my limited experience, it just takes that long to locate a mature buck. Buck movement is minimal and locating a mature buck is the hardest part of the hunt. Once the rut begins to take hold (late October to early November), scouting becomes less important. 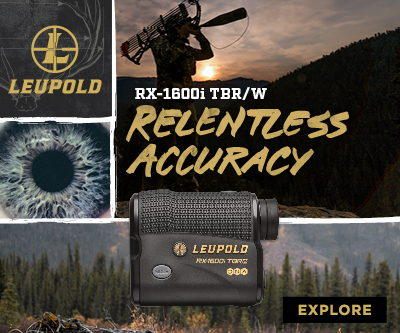 The key to success is locating concentrations of deer. 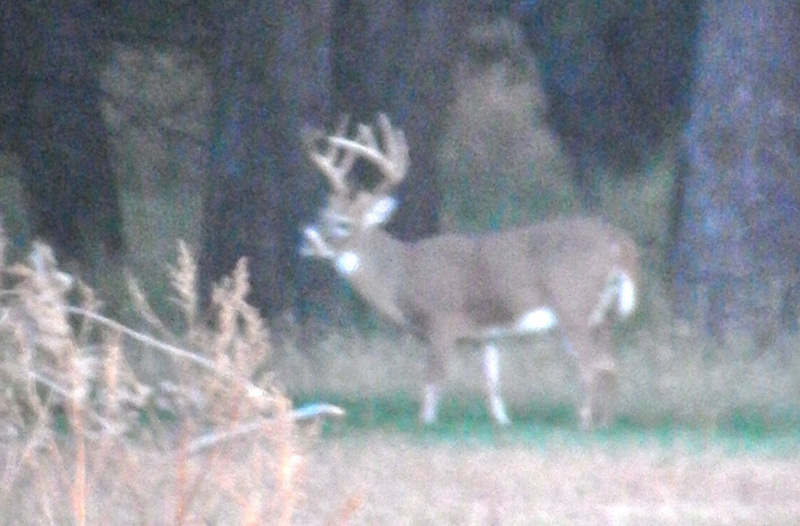 Mature bucks will move to areas with does. Locating an individual buck during this period is not as important since all bucks will congregate around doe groups. 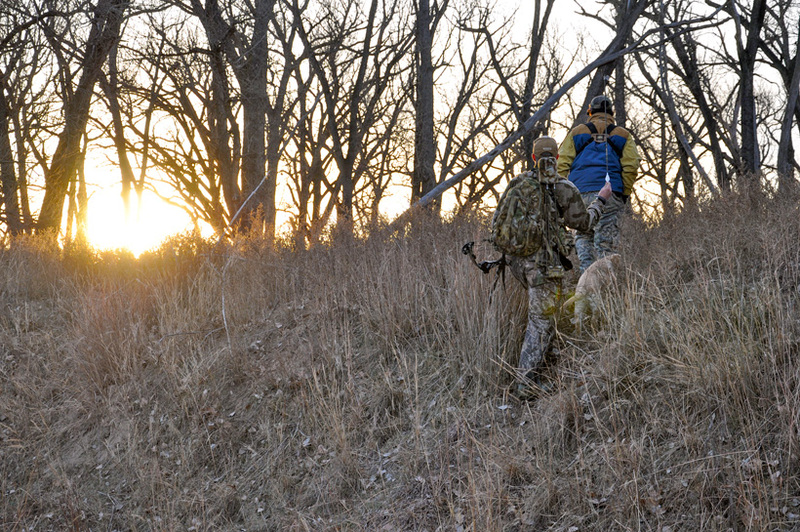 These areas are relatively easy to locate, making hunting time much more valuable than scouting. For peak rut days I want my scouting-to-hunting ratio to be < .25:1 (less than a quarter of a day scouting to one day hunting). A late season buck. This buck was a ghost up until the late season. Cold weather got him on his feet during daylight. Once post-rut conditions hit, bucks once again disperse and scouting becomes critical. Locating mature bucks is the most difficult part of these late season hunts. Once again I refer back to my 3:1 ratio of three days of scouting for every one day of hunting rule. Food sources are the key to both early and late season success. As whitetail seasons approach each year, remember to reference rutting activity while planning your hunt and apply strategies that will best suit the phase of the rut your whitetails are in.